*Garbolino Lindholme, All lakes, Sat. 52. Alan Crouch (Garbolino Ossett) 15-15-0, small carp and silvers on pole and pinkie, peg 6 Strip; Gordon Brown (Grattan AC) 12-13-0; Sid Ellis (Moorfields) 8-12-0; Paul Christie (Garbolino Lindholme) 6-1-0; Paul Dawson (Garbolino Lindholme) 5-11-0; John Allerton (Tricast) 5-10-0. 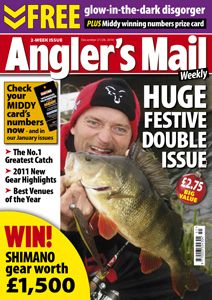 League: Tackle 2U 11; Hirst Tackle 12; Anglers World Holidays and Glen both 16. Aston Park, Lily & Split Ponds, 33. Andy Lakey (Notts) 7-15-0, silver fish on bloodworm from Split 8; Dave Hooper (Derby) 6-1-0; Steve Barraclough (Barnsley) 5-12-0; Pete Morley ( Kiveton Hall) 5-10-0; Dave Teacher (Mosborough) 5-5-0; Leon Hardwick (Mosborough) 4-3-0. Brighouse AA, Calder & Hebble Canal, Brighouse, 30. Lee Shaw (Tri-Cast Calder) 1-0-8, 80 roach on joker from Elland Basin; Ben Davis (Tri-Cast Calder) 0-10-8; Rick Taylor (Tri-Cast Calder) 0-9-8; John Holdsworth (Maver) 0-8-8. Daiwa Hallcroft, Bridge pool, Wed. 6. Arnie Payling (Peg One) 17-2-0, skimmers and perch on pole with caster and maggot, peg 20 island; Don Slaymaker (MAP Ripley) 6-14-0; Phil Morgan (Bircotes) 2-8-0. Veterans, Bridge pool, Thur. 9. Ian Temple (Retford) 9-6-0, skimmers and perch on pole with maggot and pinkie, peg 15 island; Arnie Payling (Peg One) 8-14-0; Barry Rance (Retford Honda) 7-14-0. Bridge pool, Sat. 8. Steve Clark (Mansfield Sensas) 7-14-0, roach and perch on pole with bloodworm and joker, peg 46 Outer; Brian Sullivan (Maltby) 0-14-0; Pete Bagshaw (Maver Barnsley) 0-6-0. Garbolino Lindholme, Strip and Loco, Sun. 27. Mark Booth (Garbolino Lindholme) 6-15-0, silvers on pole and worm, peg 18 Loco; Steve Rothery (Garbolino Lindholme) 6-12-0; Neil Fisher (Dynamite Matchmen) 5-2-0; Greg Norris (Woodlands Tackle) 4-8-0; Paul Cannon (Mosella) 4-1-0; Nick Speed (Dynamite Baits) 3-1-0. Mirfield AC League, Calder & Hebble Canal; 38. Martyn Highe (Hirst Tackle) 0-8-8, four roach on caster and pinkie; Alan Crook (Maver NW) 0-5-8; Neil Nicholson (Browning Quaker) 0-4-0; Dave Wilkinson (Selby) 0-2-8; Darren Shaw (Maver NW) and Steve Crossley (Maver NW) both 0-1-0. Ripon, River Ure, Ripon, 25. Alistair Atkinson (Ripon) 2-10-0, 6 grayling on pole and pinkie from peg 141; Nathan Proctor (Ripon) 2-5-0; Graham Skirrey (Maver) 1-7-0; Nick Wallinger (Ripon) 0-10-0; Wendy Marks (Ripon) 0-6-0. Rotherham UAF Fur and Feather, River Don, Sprotborough, Sun. 28. Mark Bawden (Daiwa Dons) 8-2-0, one chub plus skimmers on feeder and maggot, peg 2; John Deakin (Daiwa Dons) 6-4-0; Denis White (Maver Barnsley) 6-0-0; Mick Peverley (Rotherham) 5-8-0; Steve Donoghue (Daiwa Dons) 5-5-0; Jack Evason 5-0-0. Rotherham Winter League, River Don, Sprotborough, 44. Wayne Bartholomew (Steel City) 18-3-0, 15 skimmers on feeder and maggot from peg 48; John Bromilow (Maltby Mafia) 12-9-0; Keith Palmer (Chas Bait) 6-5-0; Ian Bowman (Steel City) 4-2-0; Chris Holden (Daiwa Dons) 3-7-0; Denis White (Barnsley Blacks) 3-5-0. Slaithwaite AA, Huddersfield Narrow Canal, Appleyards, 20. Darren Shaw (Maver NW) 5-15-0, roach to 3 oz on punch from peg 6; Paul Booth (Trabucco Halifax) 3-7-0; Tom Barlow (Maver NW) 2-0-0; Mick Tayloe (Highfield) 0-9-8.